Last month I was having breakfast with Chad and my pastor, George Tatro of Memorial Drive Presbyterian Church. Over the grits, Chad reminded us of a conversation that we had had some months previously about Memorial Drive washing the clothes for the members of Mercy. As the need had become quite urgent, the solution was seemingly straightforward. I rather boldly committed Memorial Drive to doing the washing twice a month, starting within the week. And so our laundry ministry was born. Chad delivered nine large bags of dirty laundry to Memorial Drive. In committing our new endeavour to God, a bag of the dirty laundry was brought into the sanctuary and dedicated as a part of our weekly offering in our Sunday service. 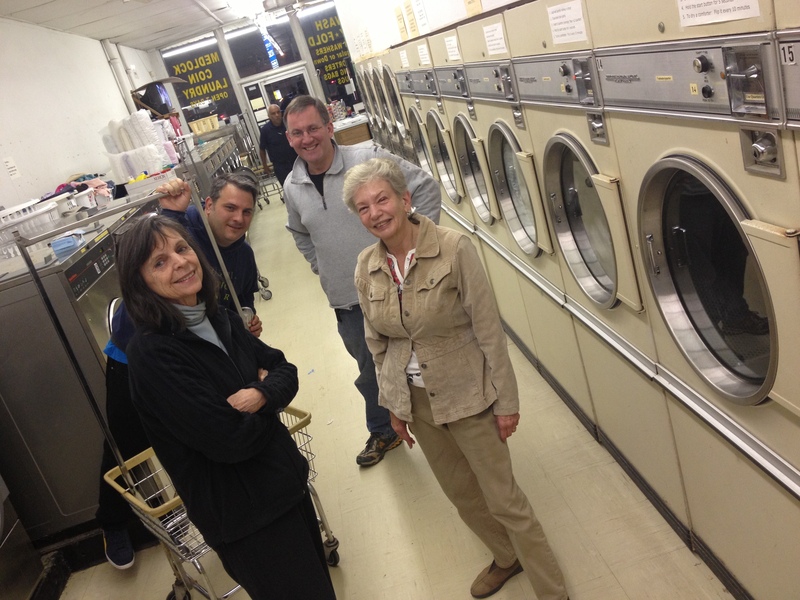 By Wednesday, I had three other volunteers to join me at the Medlock coin wash to sort, wash, dry, and fold. We had fun and fellowship with each other, so much so that some of the other patrons became curious to know what we were up to. The other week, we read together the late Lynda Baker’s homeless psalm and considered our own struggles and connivance with the ‘System’ that could not break Lynda. We like to think of the laundry as a ministry, because it sets it apart from our routine chores and helps us to be mindful that we are doing the washing in simple obedience of Christ’s injunctions to love our neighbour and make sure that “the naked are clothed.” We even have a short reflection on Scripture, sitting there on the benches in the coin wash while the washing cycle is underway. I am also delighted to say that friends from North Decatur Presbyterian Church are joining our laundry ministry and a local mosque is committed to donating clothes. We all believe, you see, that the God of Abraham is a God of promises and God is working through all God’s children.